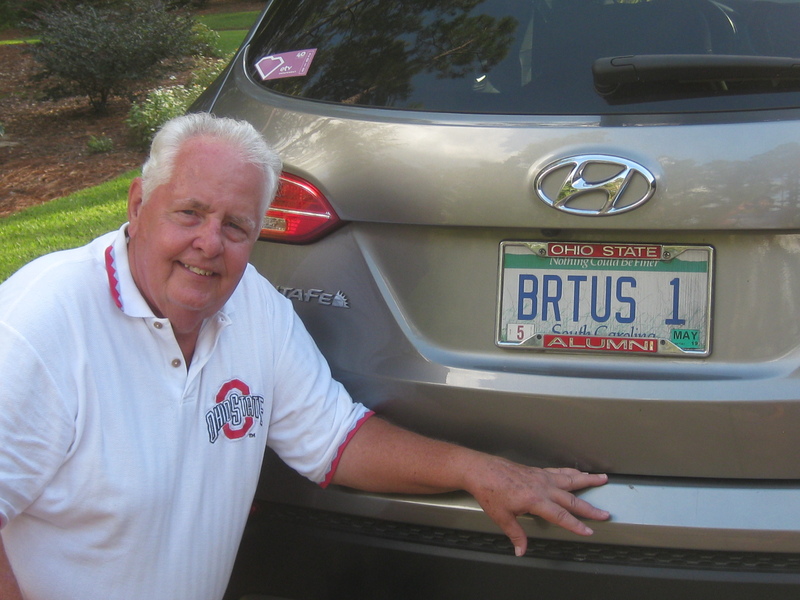 Who has the rights to the license plate BRUTUS1? Alan Kundtz, retired civil engineer from Aiken, SC, certainly is a contender. Alan wore the fiberglass model for three years, from 1966-68. 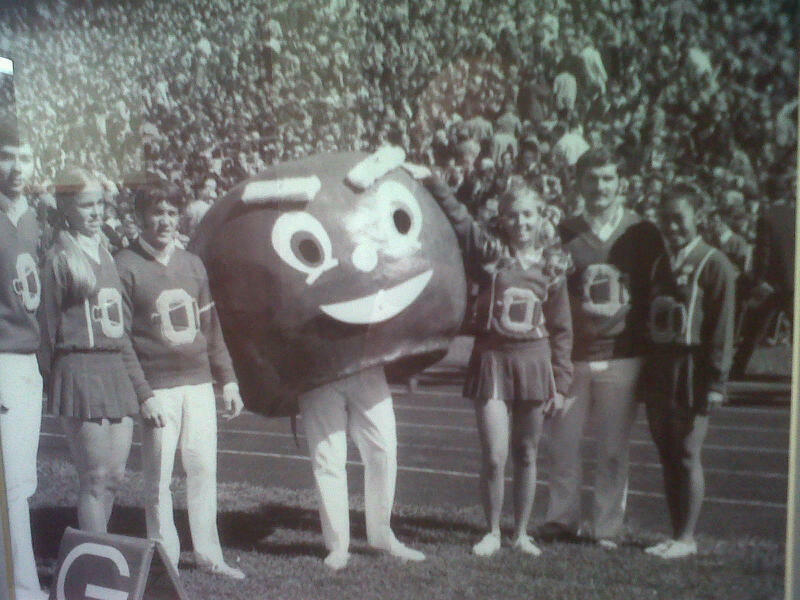 For many years, the OSU Spirit squad had him listed as the first Brutus. And his fraternity brother, Dave Hocevar, who shared the responsibilities with him for a year, calls himself Brutus #2. Here’s what happened. Ohio Staters originally “owned” Brutus but quickly put Brutus into the foster care of Block “O.” Now Block “O” wasn’t a bad choice. It was the section of students in the Shoe who held up cards to form the Block “O” and other configurations of fandom. In 1966, less than a year after Brutus’s birth, the president of Block “O” came to Pi Kappa Alpha fraternity (it is rumored she was dating a Pike) to ask for volunteers to be Brutus. That’s when Alan said, “Who the heck is Brutus Buckeye?” Back then Brutus didn’t have the persona and the fame he does today. The next question from Alan was a strategic one: “Do I get free football tickets?” When the answer was “yes,” Alan admits he was all in. Alan’s first action was to upgrade the eyebrows of the fiberglass model. His mother added fur to the stick eyebrows. The eyebrows and mouth were on dowels so Alan could maneuver them. For my part as the designer, my intent was that Brutus could animate with a happy, sad or angry face. Alan says he focused more on the smile/frown than the eyebrows. What was it like to be inside the head of Brutus? Alan recounts that he was not able to see well. The eyeholes were about at his chest, so he’d have to lift up the head to see. The eyeholes were about 4 inches round, he recalls. Alan estimates that the fiberglass model weighed about 50 pounds. That sounds heavy to me. He says it was no problem, but it did “get hot in there.” Back in those days, before stadium modernization, the front row of seats were at field level. Alan recalls lots of jeering and thrown Coke cups when he stood in front of people. Alan has two precious memories during his tenure as Brutus. The first was at the SMU game when Brutus starting the game by leading the team members onto the field with the cheerleaders. Alan was always concerned about “not getting killed.” His worst nightmare happened during the SMU game when an SMU cheerleader who was doing flips knocked into him. He went head over heels rolling on the field. Once he stood up, the “cheers of the crowd were unbelievable!” It’s always nice to be loved! The other notable memory is from Rose Bowl 1969, back in the day when the Rose Bowl was reserved for a Pac-12/Big Ten duel. 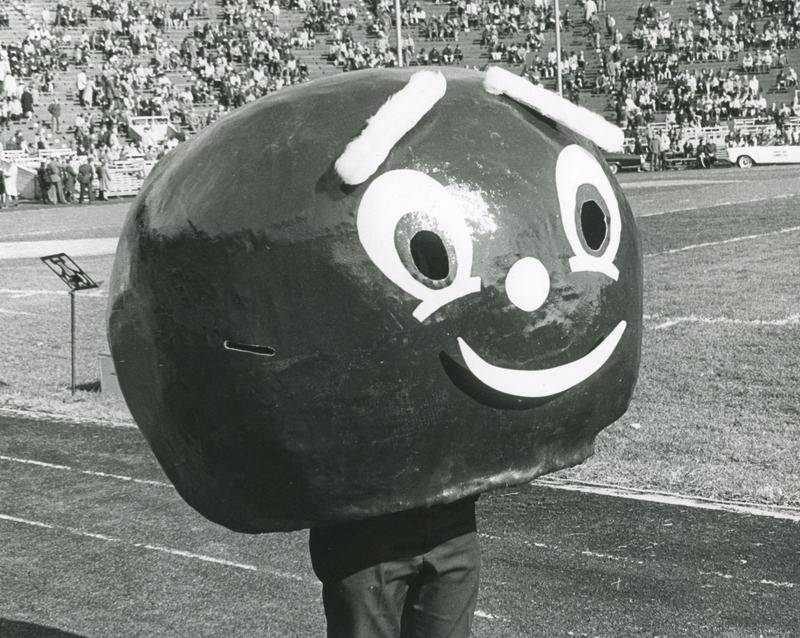 That year, Alan’s frat brother Jim Baer, then president of Block “O,” approached a tour operator with the question, “How would you like Brutus Buckeye to be part of your tour?” The negotiation involved free passage for Alan and his fiberglass alter ego. All went well until Alan tried to get the Brutus head out of a storage locker and onto the field at the Rose Bowl. Since the Rose Bowl officials had no idea what a “buckeye” was, it took him the better part of the first quarter to get approval to bring Brutus onto the field, all the time watching USC’s Trojan horse strutting its stuff on the opposite sideline. Brutus appeared for 2nd and 3rd quarter, then Alan made sure he got the head back in the storage locker during 4th quarter. What dawned on Alan late the next morning was that no one had made arrangements to transport Brutus to the airport. Brutus wound up taking a later flight. When Brutus arrived at the airport in Columbus, there was no one to claim him. That’s when a famous photo of Brutus was published. 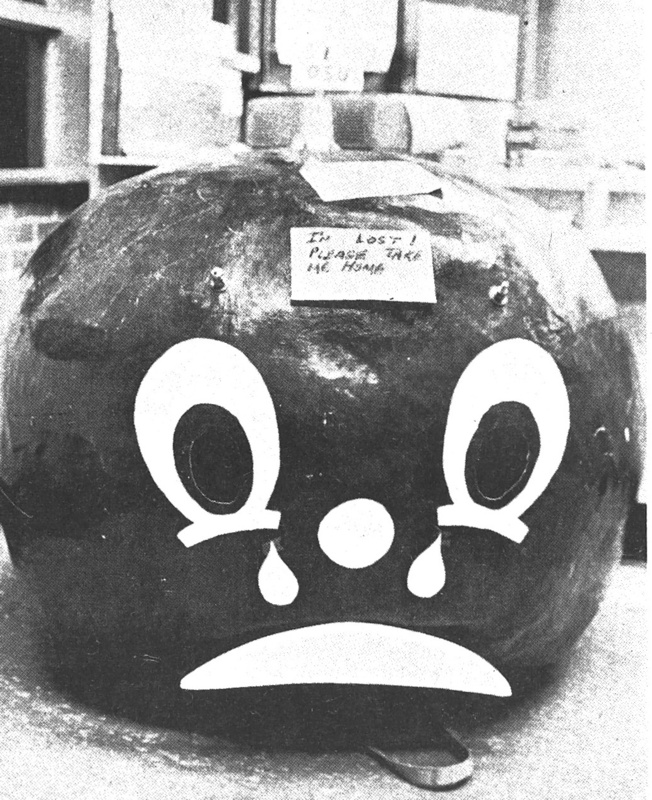 Port Columbus employee Charles Kerecman added big paper tears under Brutus’s eyes and a note reading, “I’m Lost. Please take me home.” Block “O” saved the day and ransomed Brutus back. Alan was born and raised in Fairview Park, Ohio, near Cleveland. After graduating as a Civil Engineer, he worked in Columbus, Florida, and Charlotte, NC, before retiring to Aiken, SC. 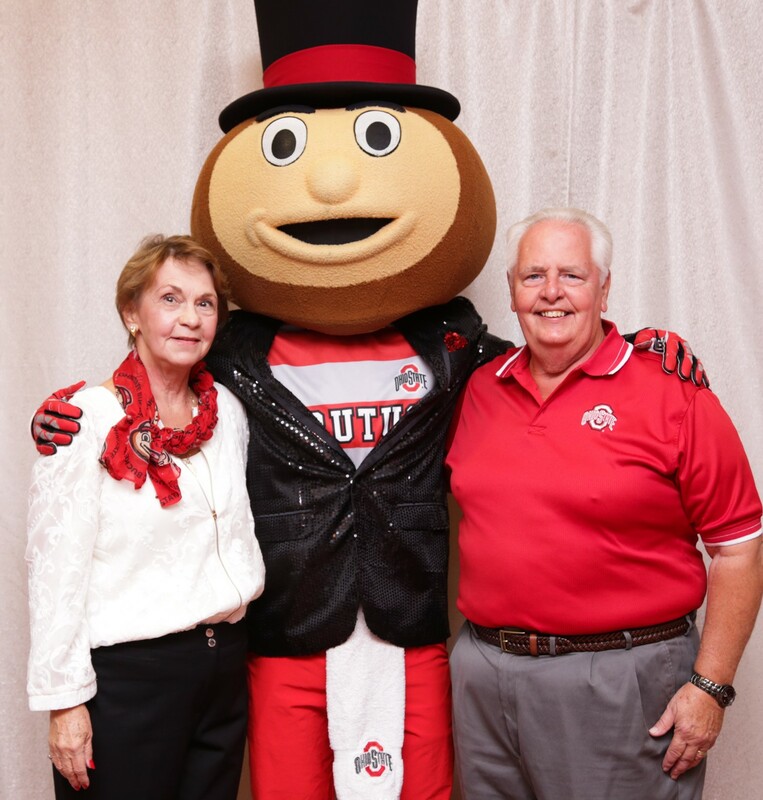 When he comes back to Ohio, it is to visit family in Fairview Park or old neighbors in Columbus, although he did make it to Brutus’s 50th in 2015 where he had an interesting conversation with Dave Hocevar, Brutus #2, about which years they shared Brutus duties. They had different memories. Alan doesn’t go back to the annual Cheerleading reunions, which makes sense, because Brutus was “parented” by Block “O” then, not the Spirit Squad.